When the European General Data Protection Regulation comes into force on 25 May companies will be required to secure their sensitive, or even secret data, adequately. Not only digitally, but also physically – including, for example, records, contracts, data on personnel and customer forms in office cabinets. Security requirements are becoming more stringent. EMKA already has the solutions. The demand for electromechanical locking solutions is growing – and will continue to do so by the introduction of the EU-GDPR on 25 May. From that date onwards the physical security of office data will concern almost every company to an even greater extent than hitherto required. Many companies are already thinking about digital data protection, are reviewing the contact data on their customers and business partners, and are adapting their e-mail communication or newsletter distribution to the new law. However, they often forget that the EU-GDPR also provides for the protection of sensitive information which is stored in printed or handwritten form in files and office cabinets. The personnel departments in particular are required to do this. Companies must actively protect the data on their employees and competitors by the qualifying date. All sensitive documents must be stored in a protected area, with classified access facilities for the personnel managers. A protocol should show comprehensively who has inspected files and when. In order to prevent unauthorised persons from accessing these data on the one hand, and recording access gained by authorised persons on the other, electronic locks with a monitoring function offer a high degree of security. 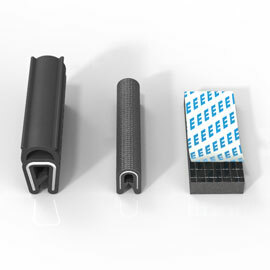 EMKA has therefore already developed solutions for a wide variety of applications. However, this is not the only legal provision to which companies must devote increasing attention from now on. For in addition to the GDPR, the EU Confidentiality Directive must be converted to German law by June 2018. Whilst it is mainly personal data that are concerned by the GDPR, the Confidentiality Directive covers, in particular, sensitive data on product development. For companies this means: protective measures such as access controls and restrictions with documentation must from now on be demonstrated by the companies concerned. Finally, employees at the workplace deal every day with sensitive, confidential data, e.g. contracts, supplier lists or patient information. The Confidentiality Directive also states: In future this will only apply to a business secret or to company know-how (e.g. data for a prototype, project data etc.) which has actively identified the company as such. If, in the event of a dispute, it cannot be demonstrated that corresponding information has been identified and protected against unauthorised access, the law does not provide any protection of this information. 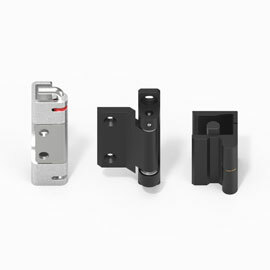 The use of electronic locking systems may be suitable solution in this connection. 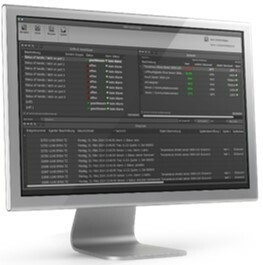 Companies need no longer shrink from switching to such systems or their re-installation. Classic locking mechanisms can be replaced or supplemented by electromechanical locks and combined with an intelligent locking system within a very short space of time. 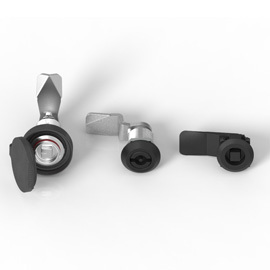 Agent-E – EMKA's electronic locking solution. With "Agent E", for example, EMKA has developed a security system which allows personalised access to the cabinet together with permanent monitoring and control of the closing and opening processes. Controlled access to the office and filing cabinets for authorised persons is achievable in many respects, for example by authorising employees contactlessly with an RFID data carrier. The scanner integrated in the handle reads the RFID card or coin, thereby identifying the user. Depending on the preference of the company, the lock can also be actuated by means of an app, a pin code pad, a fingerprint sensor or by Near Field Communication (NFC). Since the system is individually adaptable to the customer, according to how he would like to actuate the lock electronically, a great many applications are possible. If required, the system can control all the opening and closing processes via the software Control Cockpit. For as already mentioned, traceability also plays an important part within the framework of the new EU-GDPR. If an unauthorised person opens a filing cabinet in the personnel department without prior authentication, the central office will be informed immediately and is able to react. The Control Cockpit manages all the access authorisations and documents every opening and closing process. The new eCam system secures cabinets against unauthorised opening. 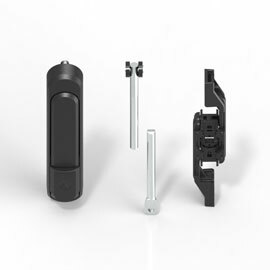 Moreover, EMKA has recently added the new "eCam" system to its portfolio of electronic locking systems: An electromechanical tongue closure which is installed inside the cabinet secures doors, valves etc. against unauthorised opening – to protect against theft or sabotage. There are many reasons for upgrading commonly occurring mechanical locks or expanding them with electronic systems. 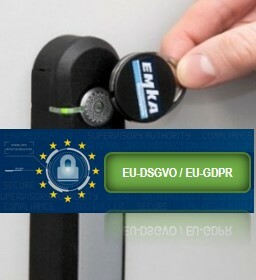 EMKA offers a broad portfolio of electromechanical locking solutions which are suitable for almost every branch of industry within the scope of the GDPR – including central monitoring of all cabinets containing sensitive data.